Well I wasn't gone anywhere. I was just consumed with discussing my daughter's leaky gut and food sensitivities and cooking new recipes for her. But my sweet tooth was getting impatient with me baking for her. Baking things I can't eat on the Candida diet like gluten free home-made granola and cornmeal muffins. So last night I whipped up this blueberry crumble. Something that could appease both of us and not upset our "diets". The base is made with a combination of coconut flour and flax and I used Chia gel as a replacement for the eggs. Worked like a charm. The berries are a debatable Candida diet item but given there is one cup of berries for the whole recipe I think it should be fine. Unless you plan on sitting down and eating the whole thing in one sitting. Which I must admit I was tempted to do. It was that good. 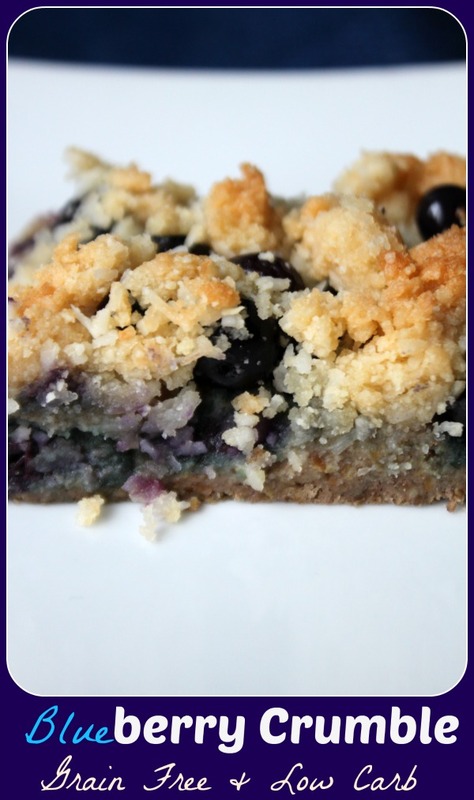 I sweetened the topping with a small amount of Xylitol and it was plenty sweet for me. I try to use Xylitol in extreme moderation and stick to Stevia 95% of the time but this was calling for some "sugar". Overall a great recipe that is quick to throw together and it safe for many different low-carb and food sensitivity diets. Greese an 8 x 8 baking dish with butter. Mix together milks, vanilla, chia gel and Stevia. Gently combine until fully mixed. Let stand for 10 minutes before pouring into baking dish. Smooth out top with back of a spoon so it is even. Bake base for 10 minutes. Combine blueberries and lemon juice. Spread evenly over cake base. Combine almond flour, coconut flour, coconut and Xylitol. Cube butter into small pieces and add to dry ingredients. I use my hands to blend the butter into the flour until it is fully combined and crumbling. Spread over top of blueberry filling. Bake in oven for an additional 20 minutes. Remove from oven and let cool before slicing and serving. Can you do it with eggs instead of Chia gel? I'm sure that would work just fine. I just avoid egg for my daughter but it generally works better in most baking. Let me know if it works out.